CAMPUS TECHNOLOGY article (5/11/16) by Dian Schaffhauser – An accrediting agency and an education technology company are working with six institutions to test out a mapping process that will handle block transfer of learning outcomes and proficiency criteria. 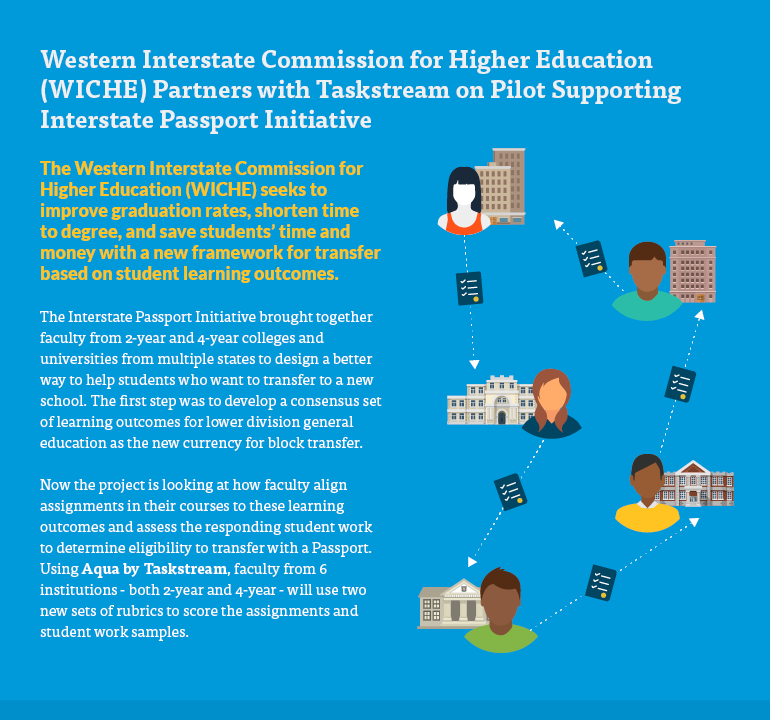 The initiative, which brings together the Western Interstate Commission for Higher Education (WICHE) and Taskstream, is intended to support a national framework put forth in WICHE’s Interstate Passport Initiative. Taskstream is a company that works with colleges and universities on setting up assessment management and eportfolio systems. eCAMPUS NEWS article (6/10/16) – Six institutions to use Aqua by Taskstream to assess student learning and proficiency as part of a new framework to aid student transfer and improve graduation rates how to measure that learning.